Remediation activities often include excavations in and around buildings and structures that should not be undermined. 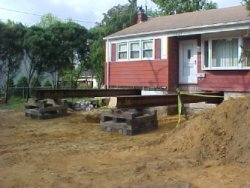 CEMCO’s staff of trained “Competent Persons” (OSHA Excavation Standards), recognize that excavations deeper than the building footers may eventually shift, risking structural failures. CEMCO offers sound solutions for handling these concerns, including demolition or partial demolition and re-build, cribbing and steel, concrete columns, and the Helical Pier technologies of AB Chance. We will evaluate the site specific conditions and develop a cost-effective plan customized to your project. 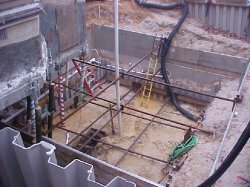 Helical Pier technology allows us to leave foundations, and even slab floors, undisturbed while working under and around them. CEMCO is a premier area installation contractor, with multiple teams ready to install structural support per your engineered plans or help you develop plans with our contract professionals. All of our supervisors and estimators are certified and trained by AB Chance, and we re-train regularly to assure you get the best structural support currently available. 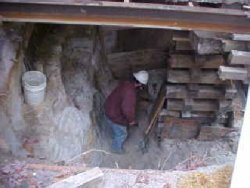 CEMCO specializes in projects involving excavations under and near buildings. Our vast experience in structural support includes various sized concrete columns set into bedrock, supporting the building from the second floor and/or the foundation, and upgrading balloon constructed homes to allow for wall and floor support. If the most efficient methods of remediation require temporary relocation of structures, CEMCO has the experience – whether it involves moving the existing structure, rebuilding the foundation, or utilizing prefabricated walls and foundations. Our trained pier installers, OSHA Competent Persons, and experience ensure that the job gets done - correctly, safely, and permanently.